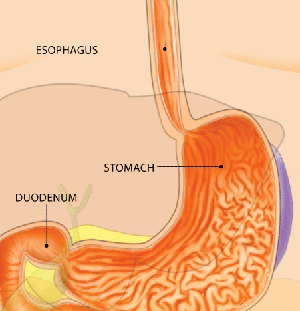 Understanding Esophageal Dilation - Reflux, Stomach Pain, Ulcers - Stephen Severance, M.D. The provider may spray a local anesthetic into the throat and give you sedatives to help you relax before passing the endoscope through your mouth and into the esophagus. Then your provider will determine whether to use a dilating balloon or plastic dilators to stretch your esophagus. Esophageal dilation is a procedure that allows your provider to dilate, or stretch, a narrowed area of your esophagus [swallowing tube]. providers can use various techniques for this procedure. Your provider might perform the procedure as part of a sedated endoscopy. Alternatively, your provider might apply a local anesthetic spray to the back of your throat and then pass a weighted dilator through your mouth and into your esophagus. 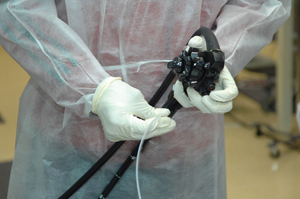 An endoscope is a medical device used by expert providers to look inside the digestive tract. An empty stomach allows for the best and safest examination, so you should have nothing to drink, including water, for at least six hours before the examination. Your provider will tell you when to start fasting. Tell your provider in advance about any medications you take, particularly aspirin products or anticoagulants (blood thinners such as warfarin or heparin), or clopidogrel. Most medications can be continued as usual, but you might need to adjust your usual dose before the examination. Your provider will give you specific guidance. Tell your provider if you have any allergies to medications as well as medical conditions such as heart or lung disease. Also, tell your provider if you require antibiotics prior to dental procedures, because you might need antibiotics prior to esophageal dilation as well. Your provider might perform esophageal dilation with sedation along with an upper endoscopy. Your provider may spray your throat with a local anesthetic spray, and then give you sedatives to help you relax. Your provider then will pass the endoscope through your mouth and into the esophagus, stomach and duodenum. The endoscope does not interfere with your breathing. At this point your provider will determine whether to use a dilating balloon or plastic dilators over a guiding wire to stretch your esophagus. You might experience mild pressure in the back of your throat or in your chest during the procedure. Alternatively, your provider might start by spraying your throat with a local anesthetic. Your provider will then pass a tapered dilating instrument through your mouth and guide it into the esophagus. Your provider may also use x-rays during the esophageal dilation procedure. After the dilation is done, you will probably be observed for a short period of time and then allowed to return to your normal activities. You may resume drinking when the anesthetic no longer causes numbness to your throat, unless your provider instructs you otherwise. Most patients experience no symptoms after this procedure and can resume eating the next day, but you might experience a mild sore throat for the remainder of the day. Your provider will advise you on eating and drinking. If you received sedatives, you probably will be monitored in a recovery area until you are ready to leave. You will not be allowed to drive after the procedure even though you might not feel tired. You should arrange for someone to accompany you home, because the sedatives might affect your judgment and reflexes for the rest of the day. Although complications can occur even when the procedure is performed correctly, they are rare when performed by providers who are specially trained. A perforation, or a hole of the esophagus lining, occurs in a small percentage of cases and may require surgery. 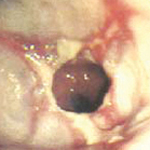 A tear of the esophagus lining may occur and bleeding may result. There are also possible risks of side effects from sedatives. It is important to recognize early signs of possible complications. If you have chest pain, fever, trouble breathing, difficulty swallowing, bleeding or black bowel movements after the test, tell your provider immediately. Depending on the degree and cause of narrowing of your esophagus, it is common to require repeat dilations. This allows the dilation to be performed gradually and decreases the risk of complications. Once the stricture, or narrowed esophagus, is completely dilated, repeat dilations may not be required. If the stricture was due to acid reflux, acid-suppressing medicines can decrease the risk of stricture recurrence. Your provider will advise you on this.